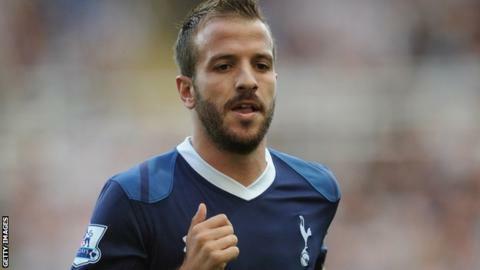 Hamburg have confirmed the signing of Rafael van der Vaart from Tottenham. The German club tweeted: "It's official. Welcome home", with a picture of the 29-year-old Netherlands midfielder in a number 23 shirt. He has agreed a three-year deal with his former club for a fee reported to be £10m. Van der Vaart spent the past two seasons at Tottenham after joining from Real Madrid on transfer deadline day 2010. The Dutchman said on his Twitter account: "Of course I am sad to leave Spurs and especially all the fans which have been nothing but great. "Thanks to the best fans in England for an amazing time." Van de Vaart played at Hamburg from 2005-2008, making more than 90 appearances and scoring 39 goals. The deal was partly financed by a local investor and coach Thorsten Fink. He said: "I am delighted that Rafael van der Vaart will be playing for Hamburg again. He will be a strong addition to our team." He scored 15 times in 36 appearances during his first season for Spurs, netting 13 goals the following campaign.